The reduce() function has to work slightly differently to the map() function. In the primary form, a reduce() function must convert the data supplied to it from the corresponding map() function. The core structure of the reduce function execution is shown the figure below. 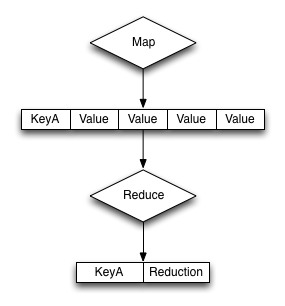 The key is the unique key derived from the map() function and the group_level parameter. The values argument is an array of all of the values that match a particular key. For example, if the same key is output three times, data will be an array of three items containing, with each item containing the value output by the emit() function. The rereduce indicates whether the function is being called as part of a re-reduce, that is, the reduce function being called again to further reduce the input data. corresponding element within the array of `keys`. * `key` will be null. The function should return the reduced version of the information by calling the return() function. The format of the return value should match the format required for the specified key.